Here are some of the main events that will occur during ConFusion. The GoH dinner happens on Thursday night. It is a meal to welcome our GoHs, fill our stomachs, and get ready for the convention to begin. Anyone is welcome to join but we do ask you to RSVP. Join us on Thursday evening following the GoH dinner for a charity event that promises to entertain as well as do good. Join us for an evening of harmonious (hopefully) humanitarianism. Share your voice, your donations, and your applause in the name of this years charity. 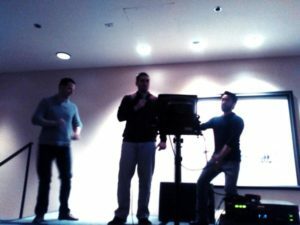 More details on Karaoke for a Cause! Merlin’s KIDS transforms the lives of dogs by rescuing them from shelters, training them and giving them a very meaningful purpose to their lives. These special dogs in turn help transform the lives of both the children and the adults they serve with a lifelong commitment to love, care for and assist…. So in essence, the dogs save the kids and the kids save the dogs; It’s a match made in heaven! Singing: We will welcome anyone who would like to lend their voice to the cause. The idea here is that panelist/attendees will pick a song to perform and the audience will show support by filling the tip jar. Duets + Groups are also welcome to perform. Multiple performances are also encouraged. This year if you would like to prepare your songs ahead of time, we will be using KaraFun and the playlist that they provide. So take a look, find your song and wow us on Thursday night! The Dessert Reception occurs on Friday night directly following opening ceremonies. 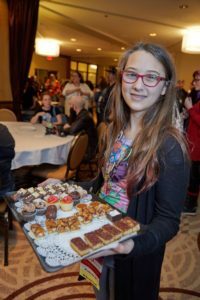 It is a chance to chat with GoHs, panelists, and staff over delicious desserts. Iron Artist is a huge event when artists compete to create wonderful pieces of art while under the clock! Check it out and vote for your favorite. Email: Art@ConFusionSF.org for more details. Authors, Artists, Musicians! 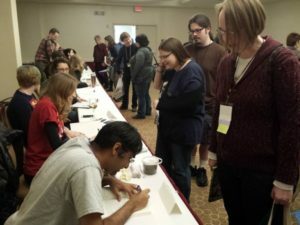 We gather them all together for a massive signing event! Look for the Autograph Session in the Program Book to find out who will be signing this year. There is no extra charge to attend this event or for signatures. Do you Cosplay? The Masquerade is the place for you! 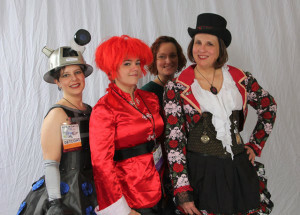 Show off your costuming talent in a themed masquerade. Email: Masquerade@ConFusionSF.org for more details. Not ready yet? You can fill out a form in person at OPS.